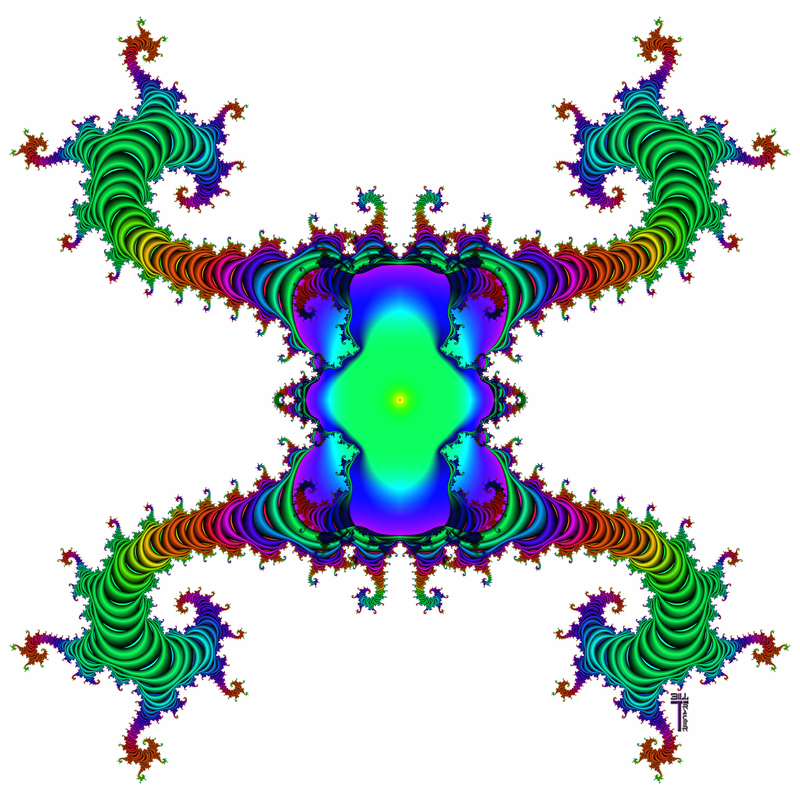 Not too long ago, I was tooling around with my favorite fractal generator, Fraxplorer from KPT, when I found a certain set of parameters that generates self-contained forms. 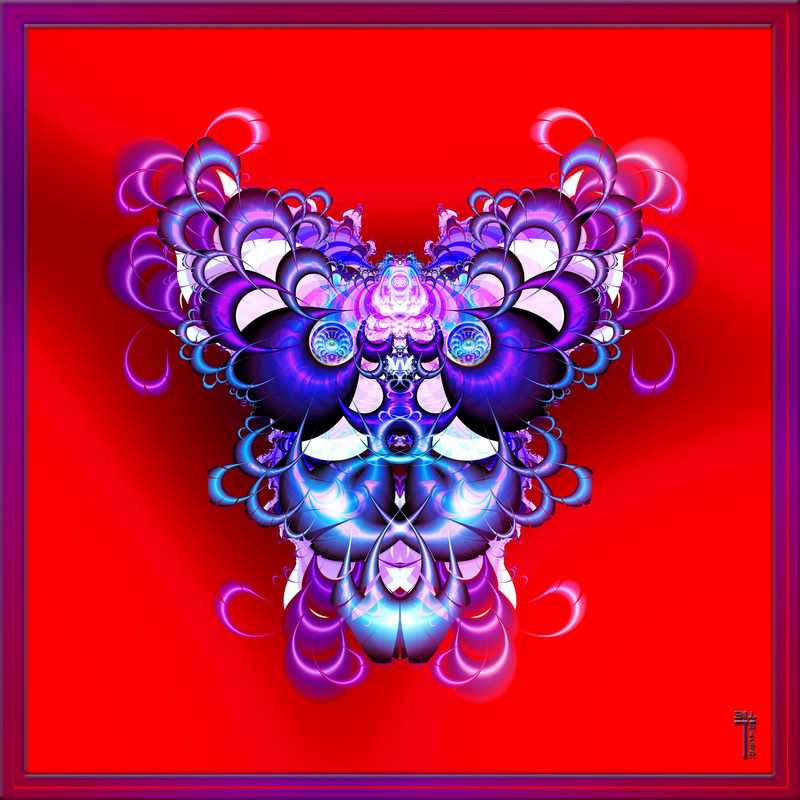 After playing with my usual image manipulations, I got around to making these forms into things that look very much like crests, so I created what I now call my Fractal Crests Series. This is an on-going active project. Thus far, I’ve created 60 of these that I consider suitable for presentation. 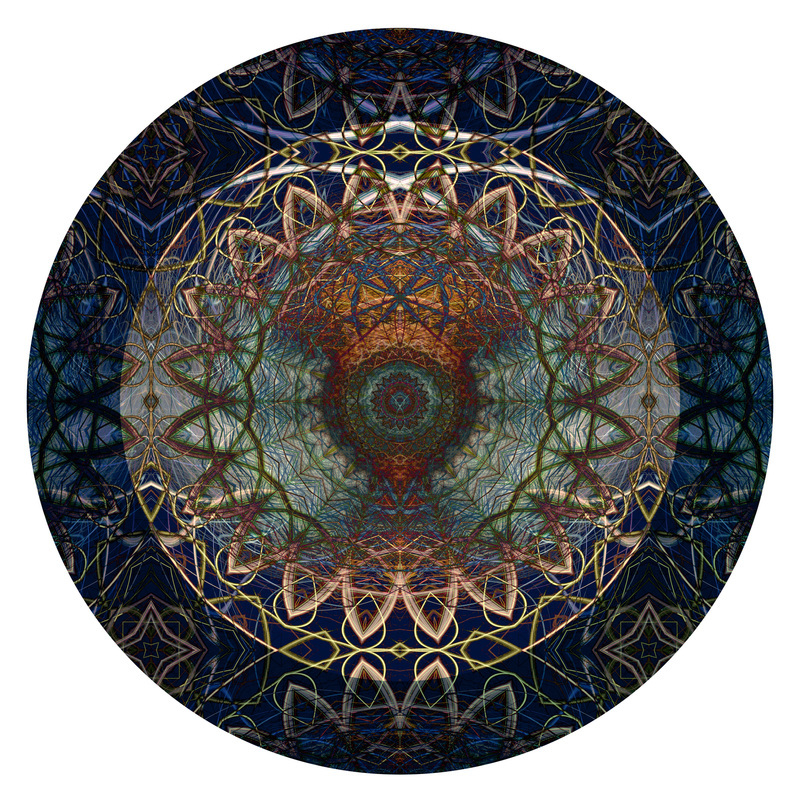 I’m still in the process of creating products at my Zazzle store with the images of this series. 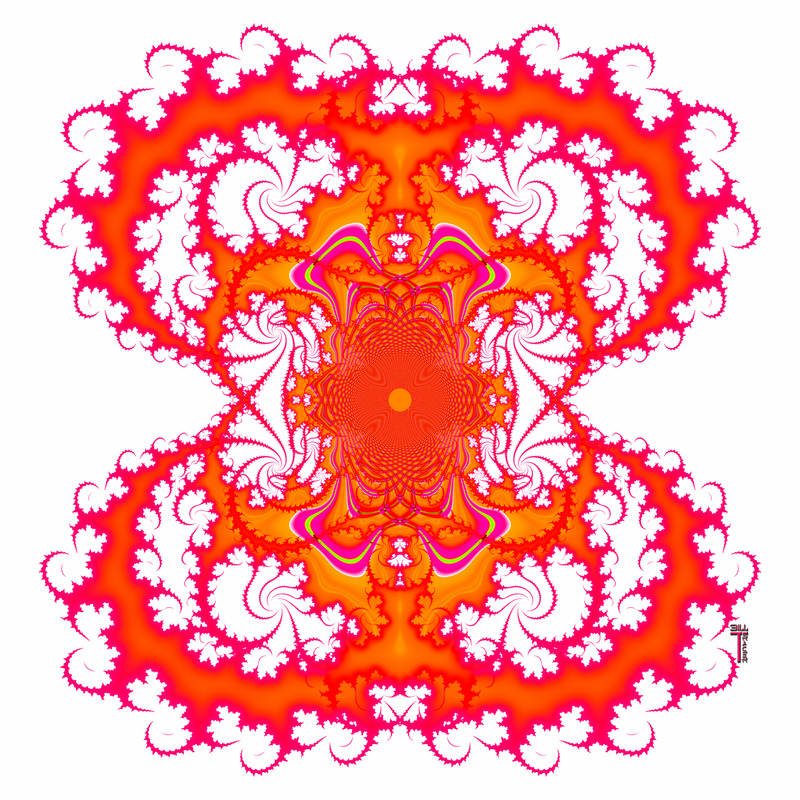 This collection is found at: Fractal Crest Products. Expect this collection to grow over time, especially in the next few weeks as I complete creating products for these initial 60 images of the series. After that, this project will go into an active long-term mode, meaning that given time I will undoubtedly add more to this series, and then of course create more products for its collection. So for those interested in this series, be sure to bookmark the collection page, and come back now and then to see the progress over time. 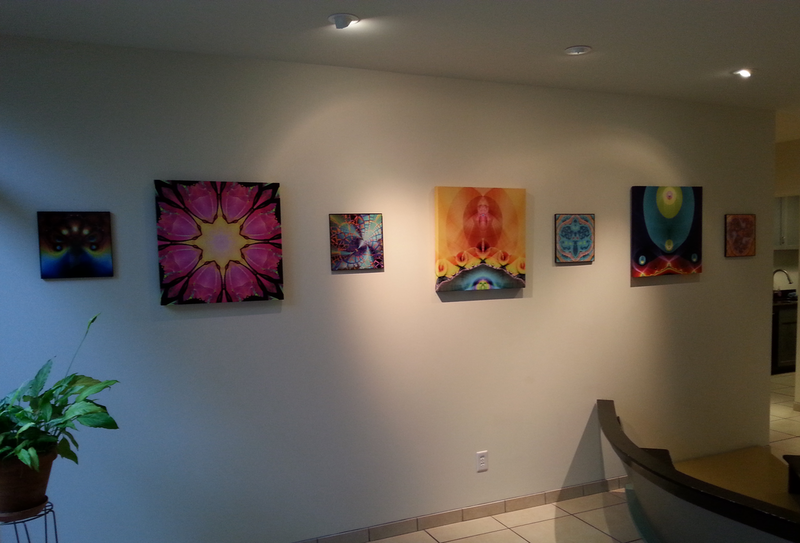 In an earlier post I looked at how with my abstract art especially I employ a philosophy of embracing emergence. 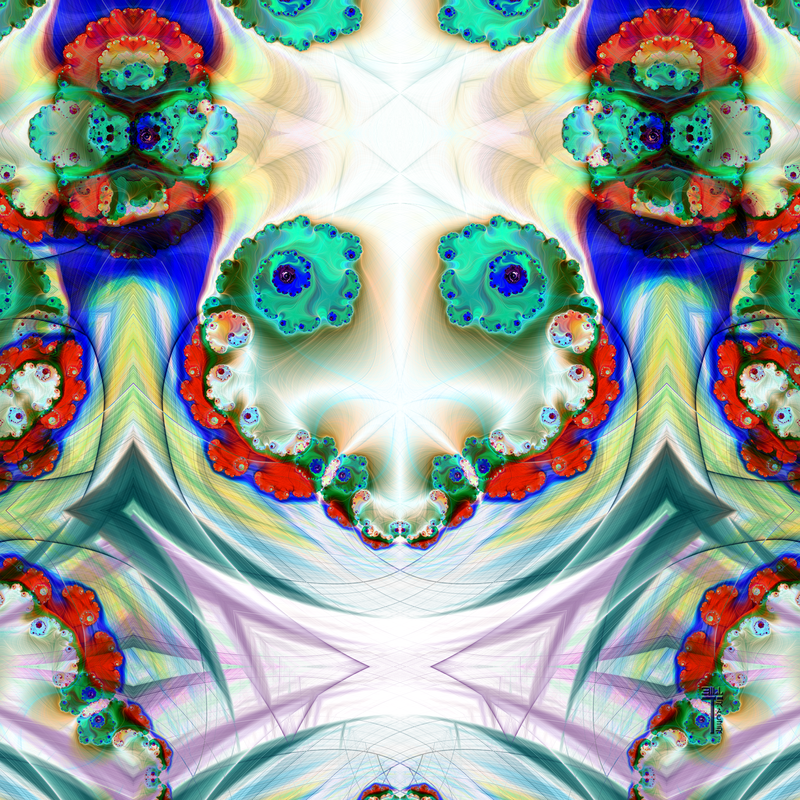 The very processes I use to create these postmodern contemporary digital fractal abstracts, take on that Zen like quality, and accommodate the science of emergent systems. Unexpected patterns emerge. The unplanned has as much to do with it, as the planned, and the result is often a kind of aesthetic Rorschach test. It’s not necessarily about what I make in the art, it’s what the viewer sees emerging from within it, and that becomes quite personal and individualized. Many times faces are among the patterns that emerge. 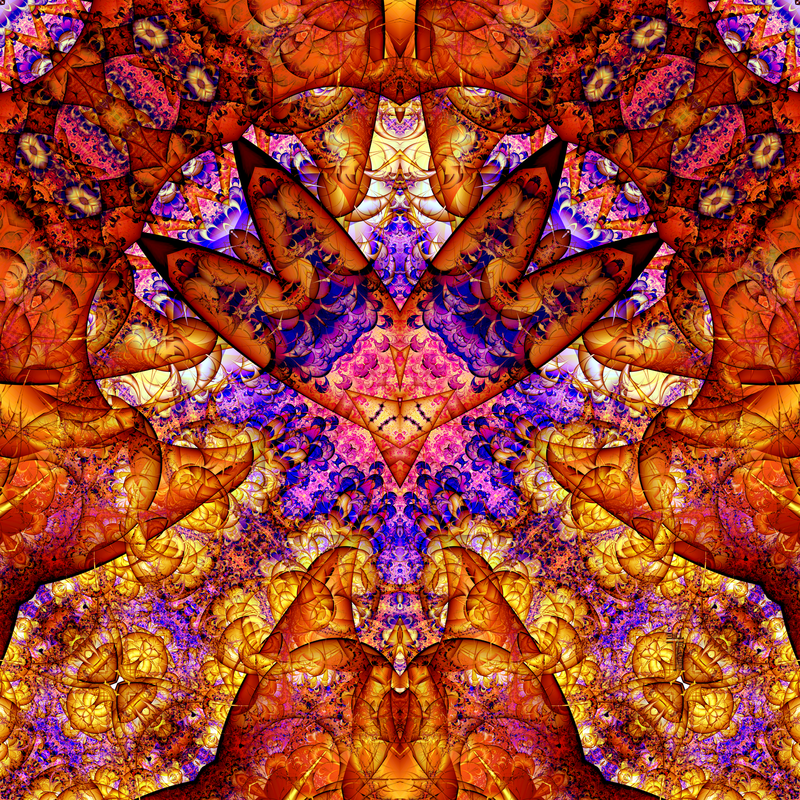 Occasionally I’ve played with these emergent faces, for example, Chester the Cybernetic Owl emerged out of this blending of layers, and filtering of various types, including mirroring and kaleidoscopic effects, as well as a little color enhancement along the way. I didn't originally set out to create Chester, rather he emerged in a somewhat spontaneous way, almost as if he sought to come into existence, and found me as the willing artistic receptor to carry out that creation. As soon as I saw him, his story emerged in my mind. After Chester, one day the Face of Lorvious emerged in a like manner, then much later the Creepy Snowman came along. I’ve now decided to make this into a project. The Emergent Faces Project is all about taking this tendency for faces to emerge from my image manipulations, and playing with it to the point of seeking such emergent faces. I am now collecting these Emergent Faces into its own new series, which will include the older emergent guys like Chester, Lorvious, the Creepy Snowman, and more recently the Flukish One, plus many more new faces emerging from the exploratory image manipulations I use in my creative processes. This project will likely be an ongoing one for a while. As new faces emerge, I will add them to this Emergent Faces Collection. It is a fairly recent project, ambitious, yet of a short term nature. 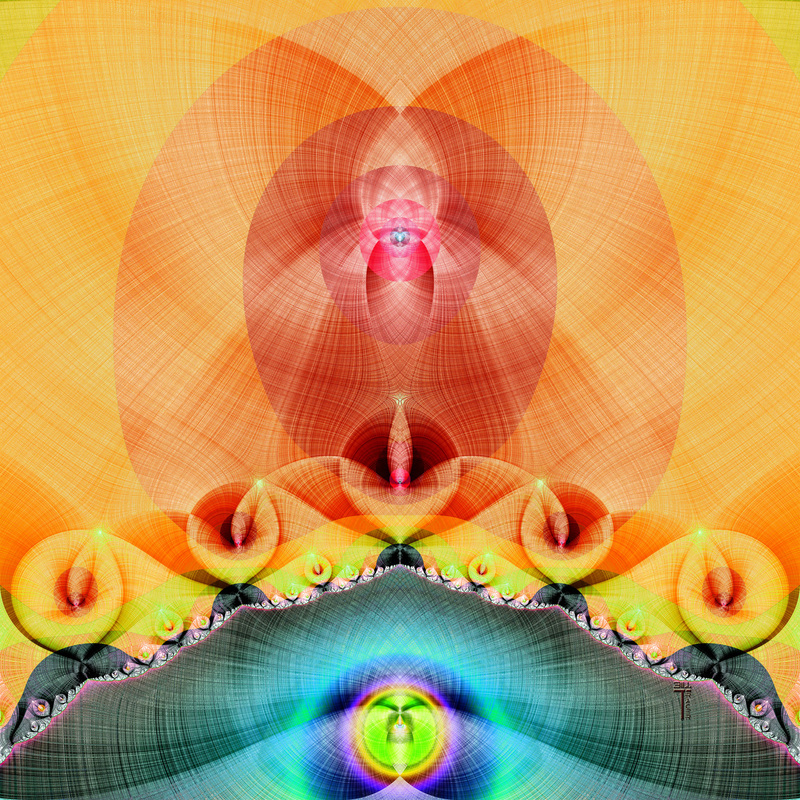 My original goal was to create an ethereal golden gateway image, derived from a specific abstract image from my Abstract Image series, Abstract Image 1674, which I later gave the more specific title, “Agape: The Lovers”. Creatively utilizing various filtering and layering effects, I initially created 12 different variations off of that image, Abstract Image 1833 through Abstract Image 1844, which now have the specific titles of “Golden Gateway Experiment 1” through “Golden Gateway Experiment 12”, then later I added another 12 to the total series of 24 images, Abstract Image 2211 through Abstract Image 2222, now known as “Golden Gateway Experiment 13” through “Golden Gateway Experiment 24”. Ironically my original goal for creating the ethereal golden gateway was achieved rather early in the project, with the forth experiment, Abstract Image 1836, also known as “Golden Gateway Experiment 4”, but I felt the desire to see just how much further I could take the many different variations that could be derived from that original image. I probably could have created more of these, but I felt I might be stretching it a bit with 24. I very recently completed the process of applying these 24 images to various products at my Zazzle Art Store. That itself turned out to be a project of several weeks. I have now applied all of these images, as well as the Golden Gateway Experiment Expanded derived from Golden Gateway Experiment 4, to the art print poster product, the custom 12” by 12” art print poster, and the wrapped canvas prints. In time, I will likely apply these to other Zazzle products. 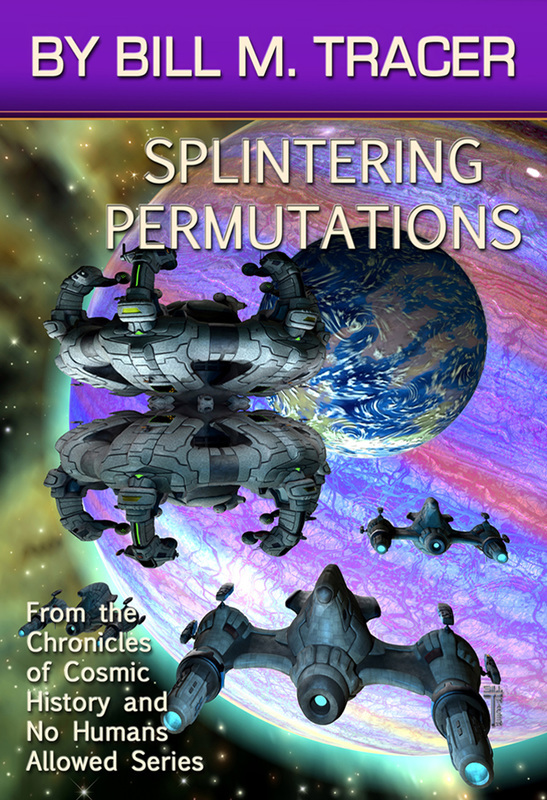 Then June 5, 2015 "Splintering Permutations" was the second e-book published story in this Cosmographic Publishing science fiction series, "No Humans Allowed", in other words no human characters. 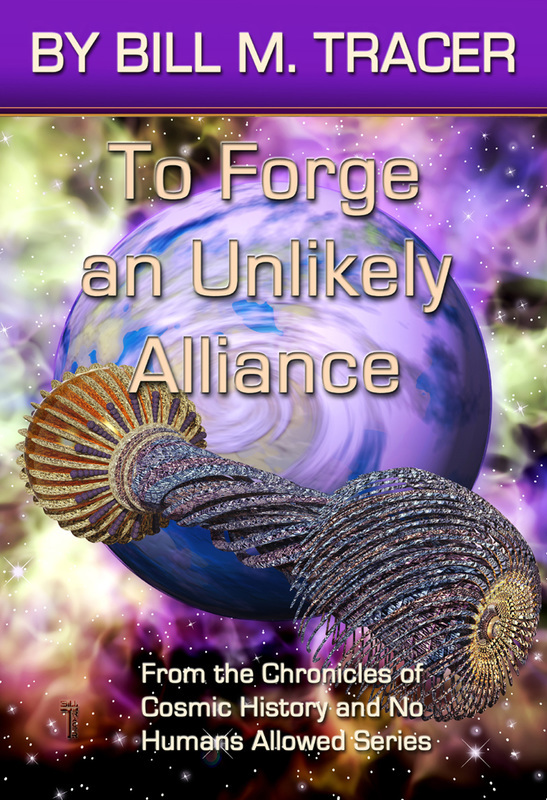 http://www.amazon.com/Splintering-Permutations-Chronicles-History-Allowed-ebook/dp/B00Z288AP2/ I updated the cover art for Story 1 of that series, "To Forge an Unlikely Alliance", in order to make the cover art consistent for both stories of this series. My current plan is that all future story releases of this series, (and there will be many), will include cover art consistent with these covers for Story 1 and Story 2 of this series. At MidSouth Con this year, I opened this series up to other writers, with a planned anthology, for which I’ll be the editor, once I’ve gotten enough submissions. So if you are attracted to the idea of writing a story with no human characters, then I encourage you to give it a shot. Arise to the challenge. See if you can do it. Teaser; there will be more about this, coming soon. Now some of you may be wondering about that reference, "From the Chronicles of Cosmic History". As a creative, I am not alone. Together, with two other creatives, we have put together a fictional “shared universe”, which we refer to as “Akasha Prime”, and all of the stories that we write occurring within the fictional time line of Akasha Prime are the Chronicles of Cosmic History. Not all of my writing falls into these chronicles, but all of those which do will always be labeled as “From the Chronicles of Cosmic History”, and will likely be published by Cosmographic Publishing. Now I could just leave it at that, and consider it the “short form”, but that’s no fun. So, let’s get into a few more details. After the first two books I mentioned in my last post, I went on the next month early in July of last year, 2014 to publish an e-book short piece for 99 cents, my first interview with a local esoteric teacher I know, who goes under the pseudonym of Dr. Ezekiel Ulster Zamar. It is Seeking the Kindness Gene: Interview 1: Dr. Ezekiel Ulster Zamar (From the Questers' Documents), found at: http://www.amazon.com/Seeking-Kindness-Gene-Interview-Documents-ebook/dp/B00LLLN6SK/ If you have any interest in a futurist view about genetic engineering, this would easily be worth your 99 cent investment. There will be more of these sorts of interviews available in the not too distant future. This e-book was one instance where I used a stock public domain image for the cover, rather than a creation of my own. I have been giving thought to redoing this cover, perhaps a good time for that might be when I publish additional interviews with Dr. Zamar. You can find Revival at: http://www.amazon.com/Revival-Bill-M-Tracer-ebook/dp/B00M6YJ0ZY/ This one has my favorite review, from an anonymous fan; short and to the point. I’m glad anonymous enjoyed it. I wish more would give it a chance and get and read this e-book short Revival, for just 99 cents. Now, rather than let this blog post get too long, I will save the rest for Part 3 of Creative Past Endeavors. Continuing the theme from my last post, allow me to expound upon my written creative work, while we still have a splash or two of my abstract art to not so much illustrate my words, as to decorate them. Unfortunately some of the first things I got published online were at a site no longer in existence. Then back in September of 2007 I started getting articles and art work published with Triond. I published several works with them from that time till December of 2012. 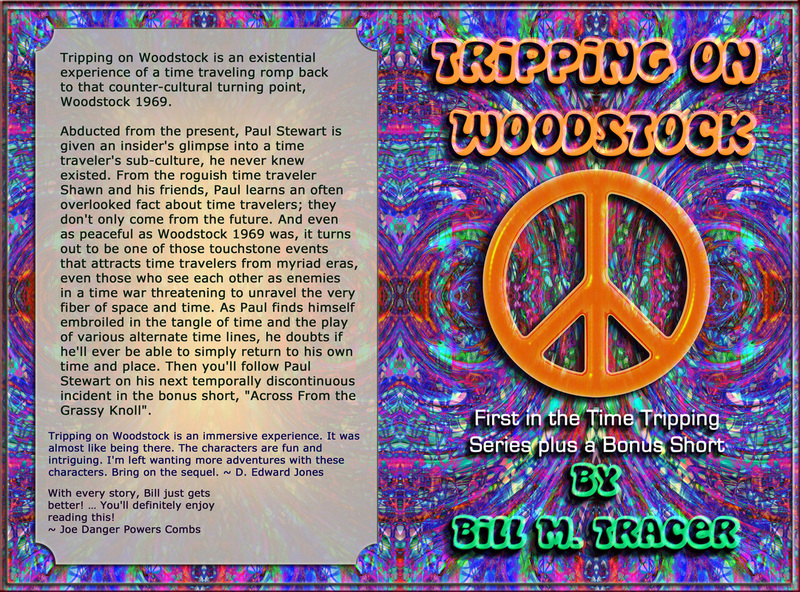 You can see my Triond work through the links and clickable thumbnails at my Bill M. Tracer Triond Profile Page. Unfortunately, the quality of Triond and its many affiliates declined over time, correspondingly as did the pay rates for Triond content creators. The difficulties compounded in 2012 with many issues, relating to lingering server problems, and unresolved disputes over faulty counting software. As a result, I decided to stop publishing anything new with Triond or its affiliates. We had a nice run, but like with many things in life it has a season, or a chapter, and then the page turns. We move on. After leaving Triond, I tried out Bubblews, but left them behind, mainly due their not paying money they still owe me, and I fully expect to never see. I do still have content there at Bill M. Tracer at Bubblews, but like Triond, I don't plan to publish anything more at Bubblews. In March of 2014 I published that first non-fiction book I spoke of in my last post. Will the ﻿Internet Achieve Sentience? Published by BMT Studio Creations. Then it was just three months later in June of that same year that I got my first science fiction book published, with Cosmographic Publishing. To Mars To Stay: To Mars To Die by Bill M. Tracer. As before, I created my own cover art for this book, which is available as either paperback or e-book at Amazon. Valles Marineris, Mars: AD 2047 Eric Sheffield stood at a rocky outcropping overlooking Eos Chasma. The huge gorge, near the eastern end of Valles Marineris, stretched before him imposingly. By comparison, this enormous valley made the Grand Canyon of Earth look like a small riverbed. The weather lingered calm that day. Eric noticed a diminutive dust cloud momentarily lift, and then drift far off within the deep ravine. Like those shifting Martian sands, his mind wandered in placid reverie, soaking up the breathtaking view. Bill M. Tracer, the rogue philosopher, artist, metaphysicist, Science Fiction enthusiast, and writer of that thought provoking stuff, conveys a cautionary science fiction tale looking at how a step that seems so right, to expand the horizons of Human exploration, might too easily descend into a misstep, spiraling down the hole of reckless abandon of the mind, body and soul. In that same book, I also included a bonus short story, “Hello I, This is H”, which made it to the 2015 finalists for a MidSouth local award, known as the Darrel﻿﻿l Awards, which are presented annually at MidSouth Con in support of MidSouth Literacy by recognizing the best published Science Fiction, Fantasy and/or Horror in Short Story, Novella, Novel, Young Adult & Other Media formats. While I didn’t make it all the way to the top, it was an honor to be among the finalists. This post is getting long, so I’ll continue my thoughts on my past creative ventures, including several e-book short stories I have published and that are currently available at Amazon Kindle, in my next blog post, which will be Part 2 of Creative Past Endeavors. In order to see all of the works I have currently published and that are available at Amazon, I refer you to my Amazon Author Page. When this world we live in had the light of my mother shining with her vibrant life, she often said of me that as soon as I could hold a crayon in my little hand, I was drawing. It was only a few years later, and I was not only drawing, but I was writing, too, often with my own illustrations. Now the things I drew, and the things I wrote back then; hmm let’s just say I still had a lot to learn. Yet those creative urges were there from the very beginning, and they continue to drive my existence to this day. I have no doubt that will trend throughout the rest of my life, as well. It is my inevitable destiny, to be born as, live out my life as, and some day die as a Creative. I intend that, and will accept no other fate. That is not arrogance. It is simply embracing what I am, without hesitancy or reservation. God knows I have enough insecurity in my life. I certainly don’t need to be insecure about who I am and what I have for a purpose in this life. So it is with confidence that I say I am a Creative, as an artist, and as a writer, and as a thinker, and as a quester into things unknown, as I have always been meant to be, and so I shall always be. So far, my primary focus on this blog has been about my artistic creations, but as I said above, art is not my only creative emphasis. I write. And as it was when I was a child, I do still tend to create art to go with my creative writing, including both interior illustrations, and my own cover art. As much as I love fiction, it is perhaps ironic that the first book I managed to get published was a work of speculative non-fiction. There are those, however, who would say that it might be stretching the category of non-fiction with this particular book. Will the Internet Achieve Sentience? Will it perhaps someday soon, if not already, awaken to self-awareness, attain consciousness, and emerge as an actual sentient being? Those and more are the questions I explored with a futurist style of speculations in that first book of mine. Will the Internet Achieve Sentience remains available as both a paperback and as an e-book at Amazon. 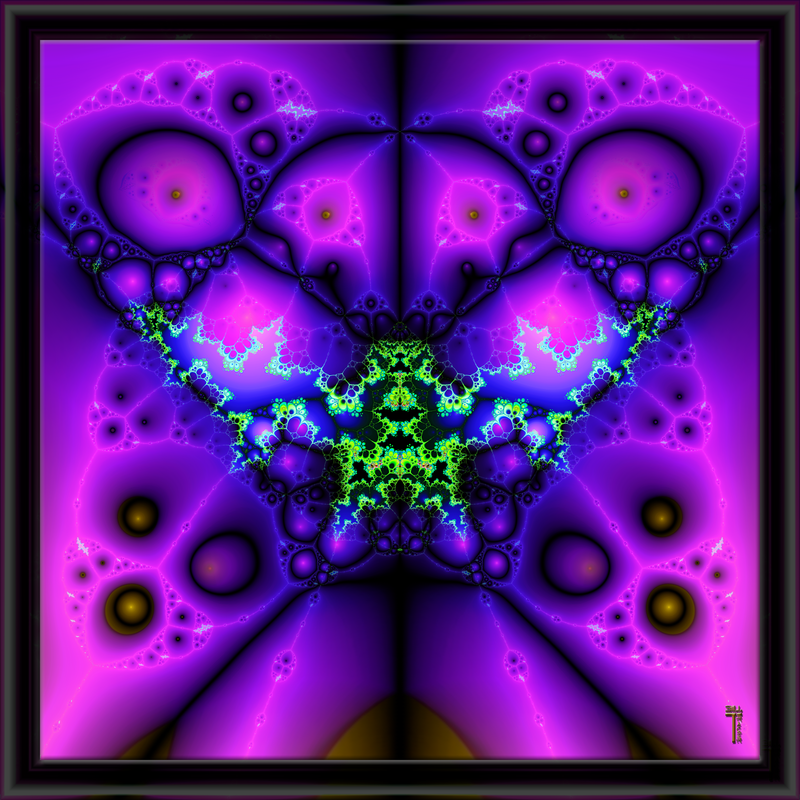 Beyond the awe, there is a philosophy behind my art, and perhaps a little bit of that scientific experimenter spirit. In my abstract art especially there is a philosophy of embracing emergence. 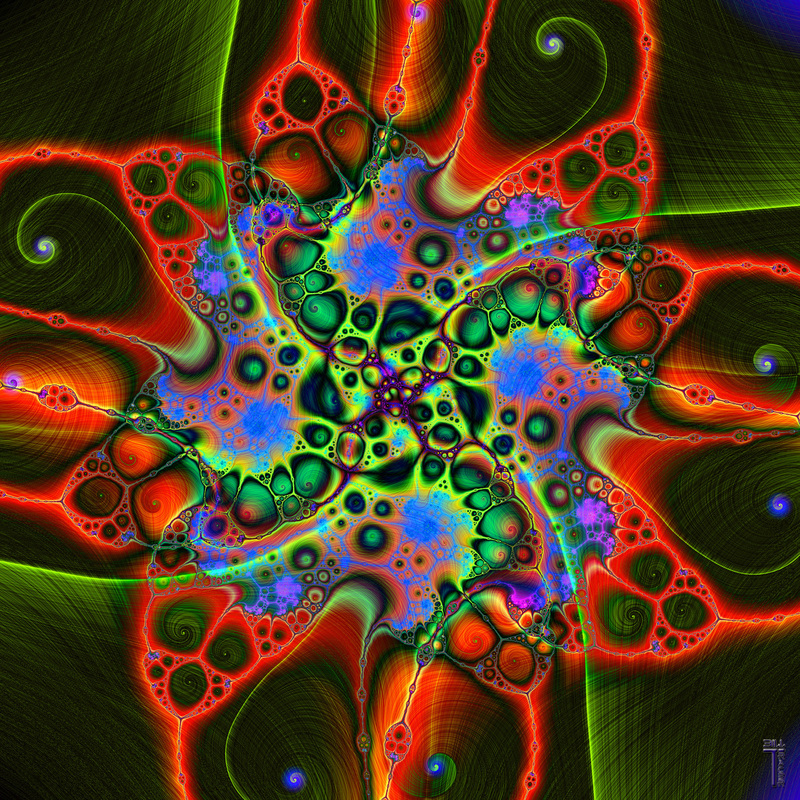 The very processes that are used to create these postmodern contemporary digital fractal abstracts, with that Zen like quality, accommodate the science of emergent systems. Sometimes unexpected patterns emerge. The unplanned has as much a part, as that which was planned, and the result is a kind of aesthetic Rorschach test. It’s not about what I make in the art, it’s what the viewer sees in it, and that becomes as personal and individualized as possible. My titles for these abstracts reflect perhaps a little of that Rorschach test of myself, for it is only after the creation that I sit back look at it, and ask myself what do I see in it? Generally the title follows as the answer to that question. That is another way in which emergent systems has a part in this creative philosophy. For example, Chester the Cybernetic Owl emerged out of the processes of my blending layers, and filtering of various types, as well as a little color enhancement along the way. I didn't originally set out to create Chester, rather he emerged in a somewhat spontaneous way, almost as if he sought to come into existence, and found me as the willing artistic receptor to carry out that creation. As soon as I saw him, his story emerged in my mind, but when you see him, you may see something entirely different than what I see in this emergence. It is probably best that my art is first viewed, before reading the title. Decide what you see first, before allowing yourself to be influenced by the title I’ve given it. In my last post I spoke of goals for my creations, especially my abstract art, which has in my view a more genuinely creative goal backing it up. What, you may ask, is this goal behind my creations? I call it “Creations to Provoke”. Simply put, my art and indeed all of my creations are to provoke; to fill the viewers’ hearts and minds with wonder, and make their eyes dance. It is to splash forms and colors before those who gaze upon my art, and give them a manifestation of immense marvel. It’s all about the Awe! That is its purpose. If you look at my art, and the first thought that comes into you mind is, ‘Awesome!’, then I have succeeded. The awe experience takes one away from one’s self for a little time, and elevates the spirit to new heights. The more we are awed, the higher our spirits soar. So, part of what my art seeks to achieve is to provoke a little of that soaring, in the process striving to enliven and up-lift the spiritual evolution of my viewers. 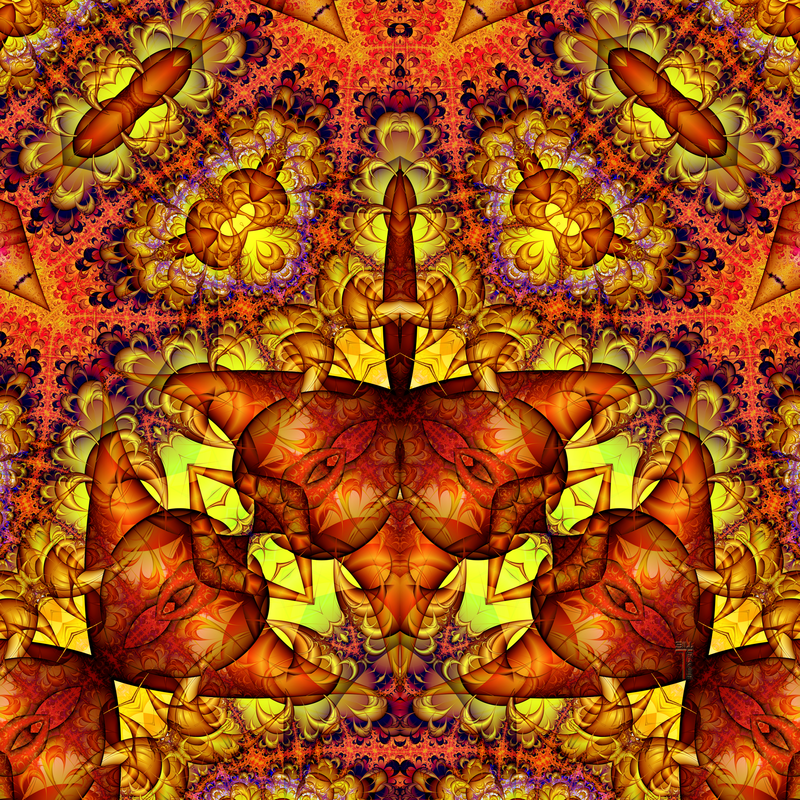 To have more of the awe experience with my art, then see my See Me Portfolio, and take a look at my Zazzle Shop, especially if you'd like to have some of my art for yourself or get some for a friend or loved one. Art gifts make for pleasant birthdays and other holidays and it would certainly be helpful to and appreciated by this particular starving Creative, Thanks. In my last post I mentioned that I produce two distinctly different kinds of digital creative outlets. I touched on the first of those two, 3D computer graphics. 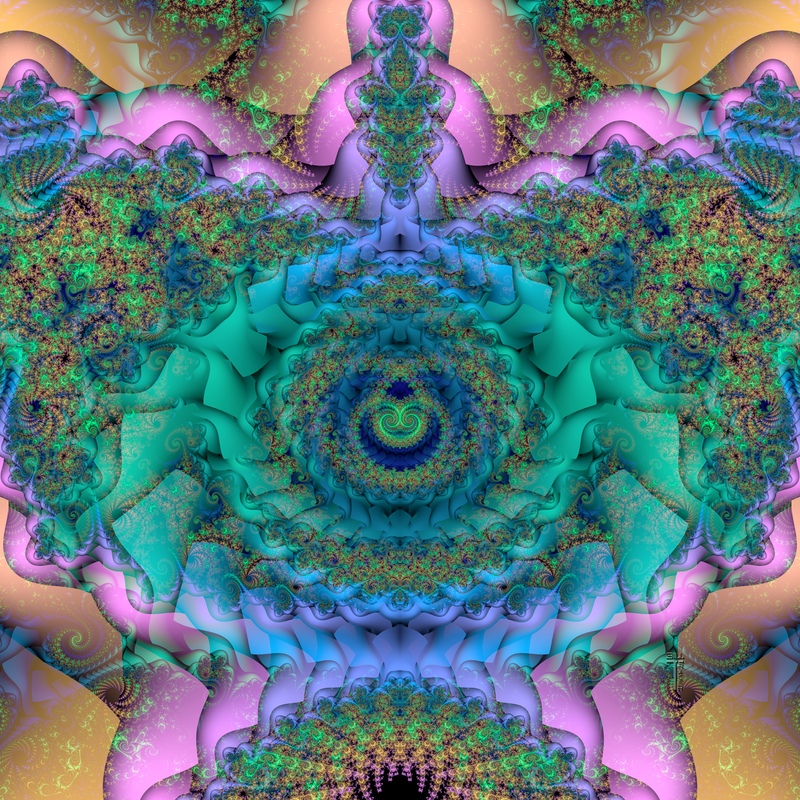 The other style of digital art that I currently spend more time working on now-a-days, are postmodern contemporary digital abstract works, heavily made up of experiments with fractal geometric layers blended creatively. I love creating these abstracts, for the very process of creating them has grown for me into a very Zen like place, as I flow the layers though a series of visual experiments, trying out various blends, filters, and color enhancements. Some days when the flow is right, I can find myself creating multiple finished pieces in one setting. Sometimes I like to create groups of color variations, or multiple versions of a theme. The titles of those groups include either a variation, or a version number. This is an old tradition among artists, which I happily uphold, and seems to fit quite well with this sort of abstract art. 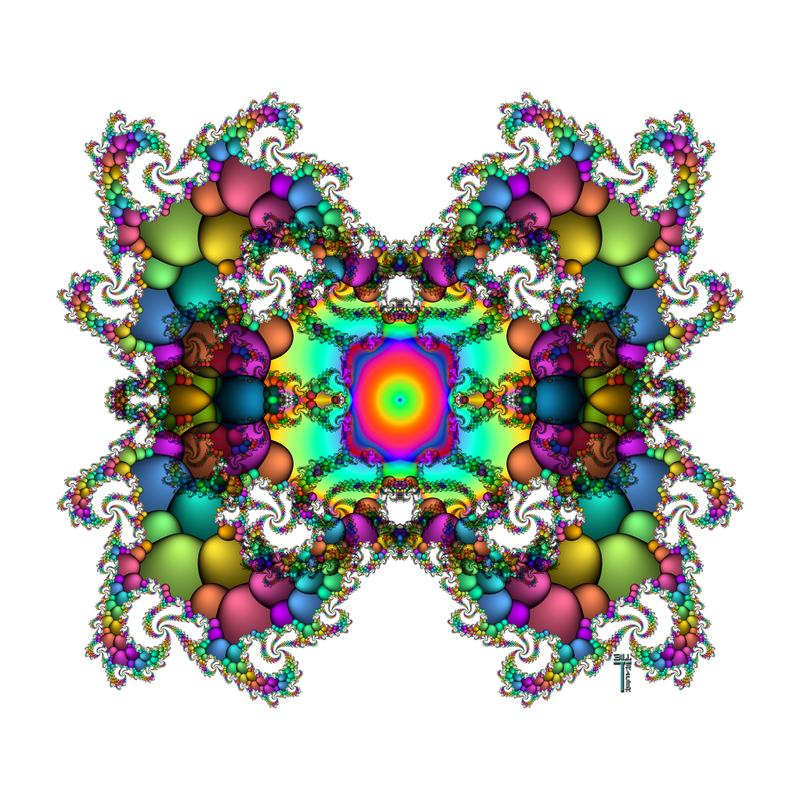 While I will always enjoy 3D computer art, I think my most genuine artistic heart is found in my abstract work. I feel a truly creative goal in this style of art. It is for that reason that I chose to make up my portfolio at "See Me" with this abstract style exclusively: See Me Portfolio. As a style of art, it has a meaning beyond a primarily commercial venture. So, in that most bohemian sense of the word it is more essentially just art for art’s sake, not art with a specific commercial purpose, such as cover art for a magazine, book, or e-book, though it most certainly is capable of being sold in various forms, not the least of which as art prints. 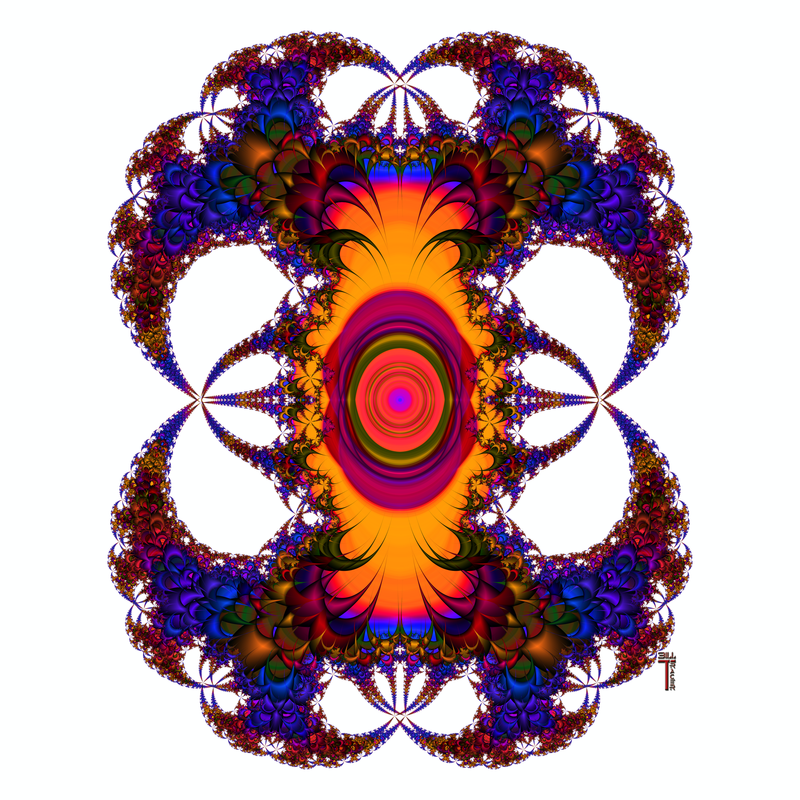 I have a department at my Zazzle store devoted to just that, Fractal And Abstract Art Prints. I guess I should start from here with what has led me to this point, and then we’ll take it from there. Bill M. Tracer Studio is my creative outlet with two distinctly different kinds of art, though on rare occasion they do cross over a bit. Those two kinds of art are both digital in nature, but are otherwise quite different from one another. 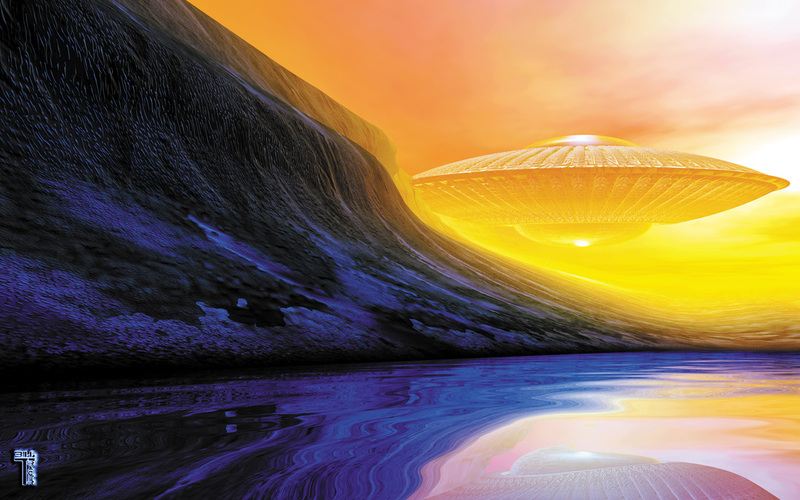 They're Here - used as the wrap around cover art for the Sam's Dot Magazine, Beyond Centauri April 2012, available now as a poster at my Zazzle Store, just click the image to purchase your own poster of They're Here. Several years ago, as a freelance artist, I created Bill M. Tracer Studio. It is the art studio through which I create many different forms of artistic expressions. But I am more than a freelance artist. I added the word “Creations” to the name Bill M. Tracer Studio, because the range of creations now comes from more than just my art studio. It now includes my studio and my office. BMT Studio Creations encompasses visual artistic creations, written creations, fiction and speculative nonfiction, book publishing, print and e-books, and with a definite movement into multimedia, now launched with this blog. 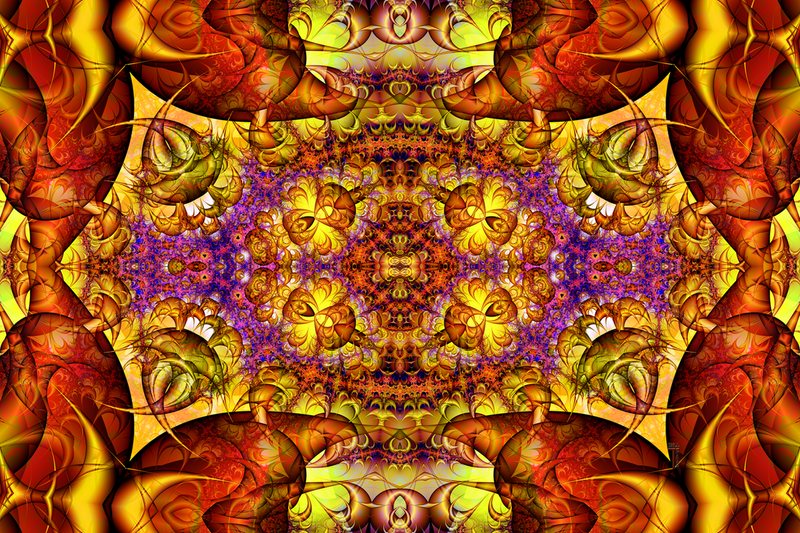 If you'd like to see many examples of my art creations applied to various art products I refer you to my Zazzle store found at Bill M. Tracer Studio at Zazzle. Consequently, my blog will be about the process of growing Bill M. Tracer Studio Creations from where it is to wherever it spreads itself further into the Cosmos. The possibilities are opened. Such is the natural way of the Creative. A Creative is harder to pin down to a specific label. Such individuals are most often repelled by labels. I know I am. So, I’m not just an artist. I am not just an author. I’m not just a speculative philosopher. I am not just an explorer of metaphysical realms, and I am not just a futurist and gazer into the Akashic Record, rather I am those plus more. I am a Creative. The life of a Creative is most often shaped much like a quest. The Creative’s quest can lead a path that may appear to some as meandering aimlessly, but be assured while it may indeed meander, it is never aimless. There is method. There is purpose with every step. I’m not just an artist. I am not just an author. I’m not just a speculative philosopher. I am not just an explorer of metaphysical realms, and I am not just a futurist and gazer into the Akashic Record, rather I am those plus more. I am a Creative.